Onlookers watch the Kinta go under. The Gulf of Mexico has a lot going for it, except for substrate—the hard material on which marine organism live and grow. That’s where this guy comes in. Artificial reefs provide habitat for saltwater fish as well as destinations for underwater divers. 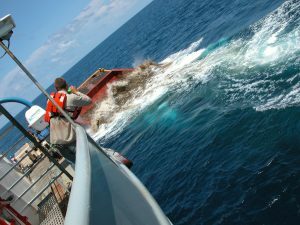 About four years ago Shively and his crew were preparing to reef a 155 foot decommissioned freighter, called the Kinta, in 75 feet of water off the coast of Corpus Christi. The ship has a new purpose on the gulf floor: nurturing marine life. Brooke Shipley-Lozano, a Scientist with the GIS Lab at Parks and Wildlife explains what happens when they reef a ship. See a video that features reefing the Kinta on the Texas Parks and Wildlife YouTube channel Find a link at passporttotexas.org. You are currently browsing the Passport to Texas weblog archives for the day Friday, November 9th, 2018.